The Amazing Ms. D, our friend Marge, and I arrived in Catania after spending a wonderful week in Palermo. We came in on the Sais Autolinee bus (€13.5). It was a nice way to travel, because we really had a chance to see Sicily, as the highway passed right through the middle of the island. We weren’t sure what to expect. 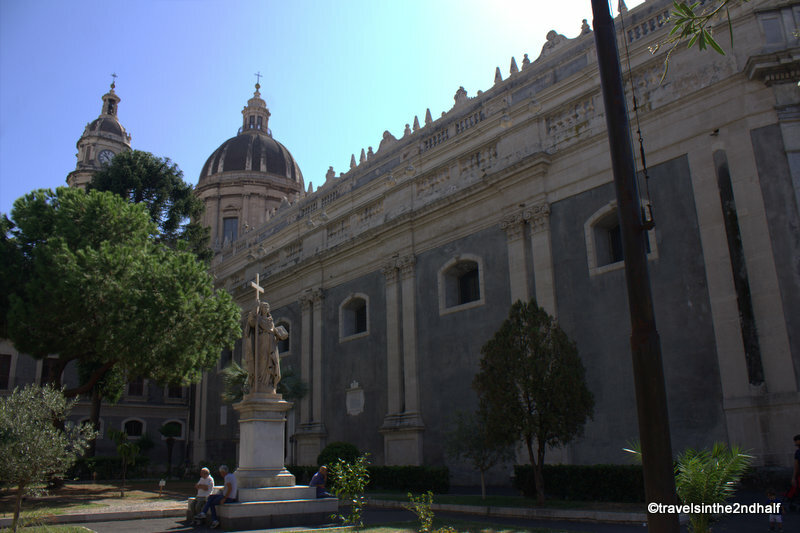 Palermo had been a beautiful surprise, and we hoped for the same in Catania. 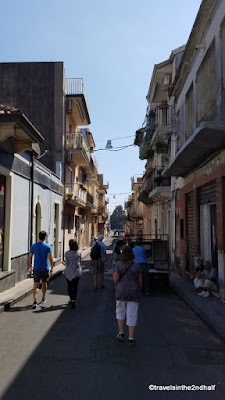 Well, we found out that while Catania was not as beautiful as Palermo (in my opinion), it certainly had its own charms that made our stay there just as much fun. 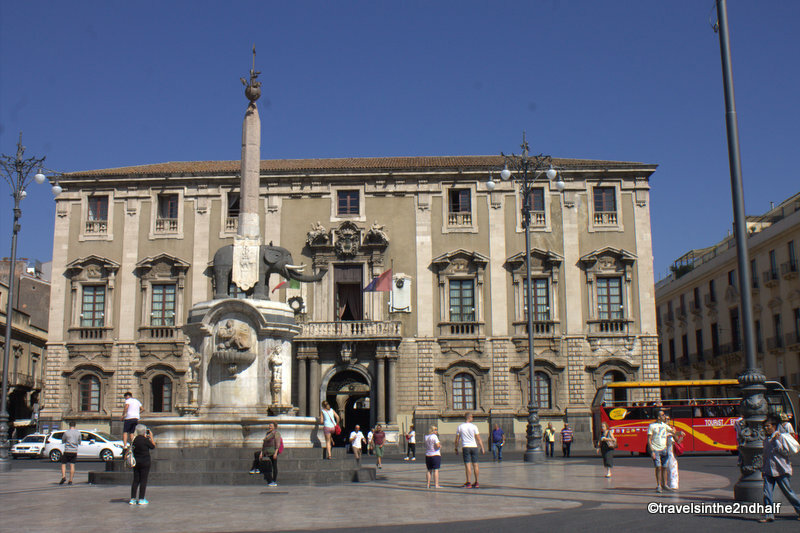 Catania is the second largest city in Sicily, and is its economic, industrial and shipping center. It dates back to the 8th century BCE, but it is also considered a “new” city, an interesting dichotomy. 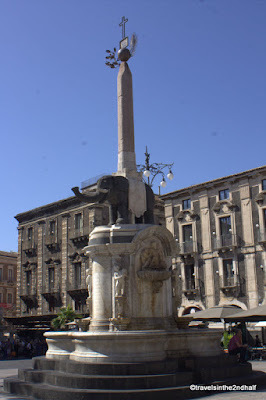 Catania’s history is tied to the fact that it sits at the foot Mt. Etna, Europe’s largest active volcano. The volcanic eruptions have made the area around it one of the most fertile regions in Italy. 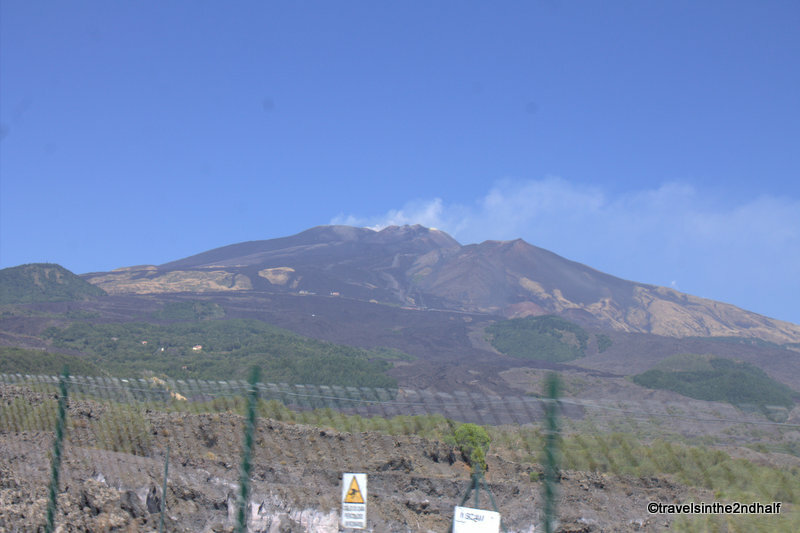 On the other hand, Etna has also destroyed Catania and other near-by towns many times over the centuries. The largest modern eruption of Mt. Etna was in 1669. It destroyed 10 towns on the southern flank of the volcano and much of the city Catania over the course of five to six weeks. It also provided most of the land that today makes up the port of Catania. 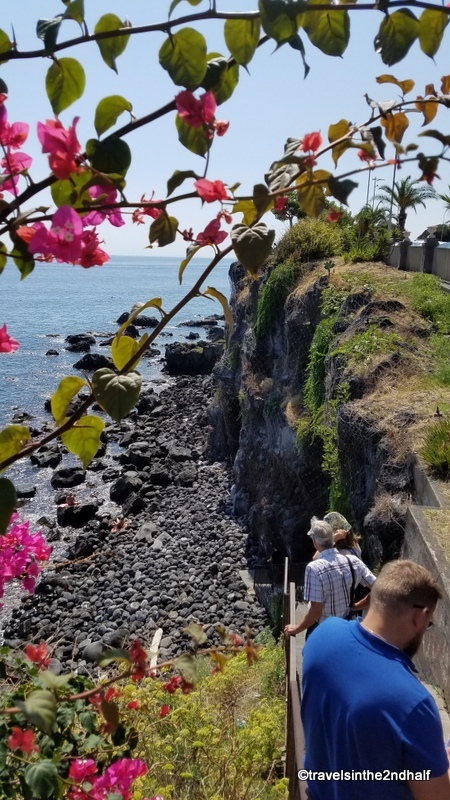 Being near a volcano also means that earthquakes are common, and in 1693 there was a massive one that wiped out most of the city of Catania and killed over 15,000 people (out of a population of around 20,000). The result of this devastation was the entire center of the city had to be rebuilt, and so it is still thought of as being the new part of town. The “new” buildings are mostly in the baroque style. These beautiful, opulent buildings use a mix of volcanic basalt and limestone to create wonderful patterns and designs. 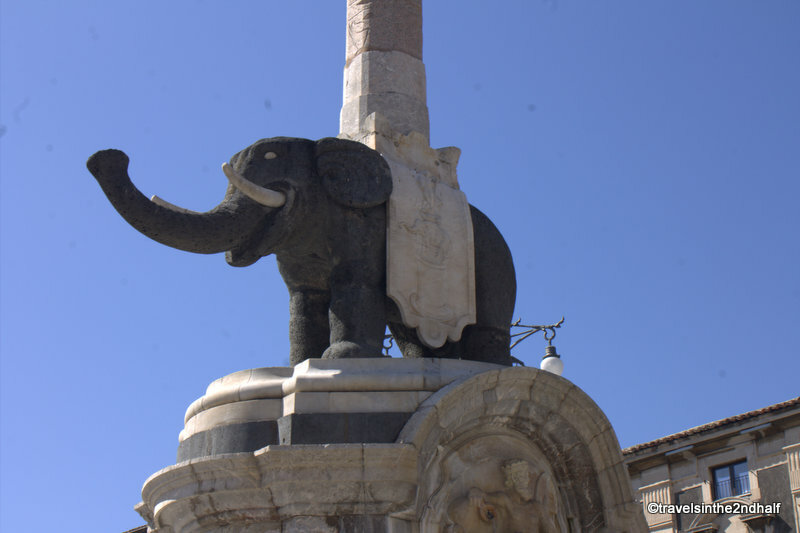 Why are there elephants in Catania? Some claim there once lived flocks of dwarf elephants at the foot of Mount Etna. Others say it is in memory of the wizard Eliodoro from the 8th century, who could turn into an elephant, or at least shape a magical elephant out of clay to carry him back and forth between Catania and Constantinople. Still others argue that the elephant stands as a symbol of the victory Catania won over Libya, and Catania was known as elephant town already during the Arab occupation. 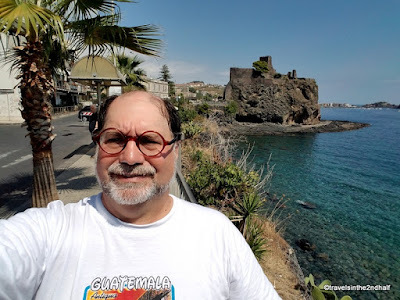 And then there are those who believe that the local elephant myth comes from an antique circus, and that the people of Catania since the 1200s have used elephants as good-luck charm to protect them against outbreaks of Etna. This statue is often described as “whimsical” because the elephant has his trunk raised and a smile on his face. I will let the reader draw thier own conclusions. This piazza is also home to the Cattedrale di Sant’Agata, the main cathedral of Catania. 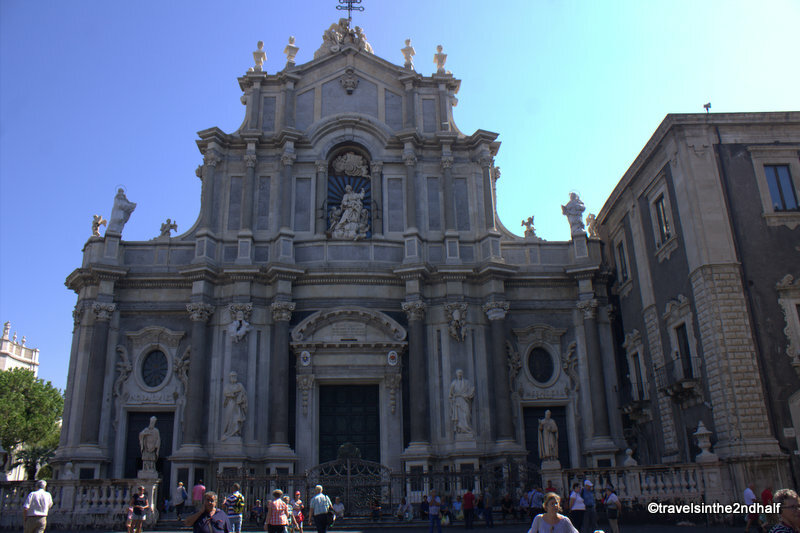 This is a beautiful baroque structure , built in 1711 and designed by Gian Battista Vaccarini, to replace the old cathedral, which had been destroyed in the earthquake of 1693. 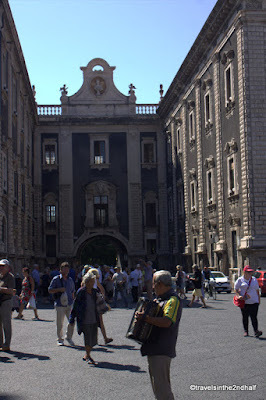 It is surrounded by other baroque buildings, most of which today are hotels. The Amanzing Ms. D and I like to take a city tour when we get to a new city. It gives us a feel for the layout of the city and points us towards sights and neighborhoods that we might not have found in the guide books. We especially like hop-on/hop-off busses because, if something catches our eye, or if we just get hungry, we can get off, and then continue on when we are ready. We found a tour in Catania that went beyond the center of the city and took us to some sights out along the coast, north of the city. The bus took us past the marina of Ognino out to the suburb of Aci Castello. 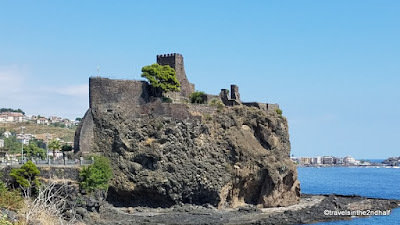 Here the Castello Norman sits on a rocky promontory along the Sicilian coast. The castle was built during the Norman Conquest out of basalt rock. 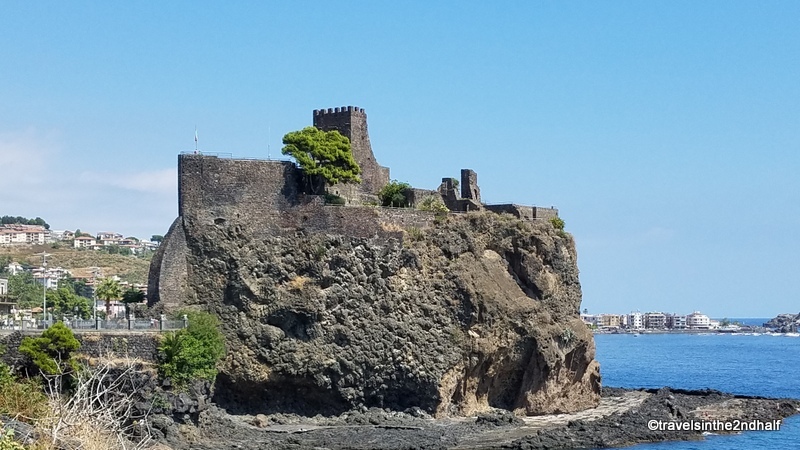 Its square tower looks out over the water, helping to guard the entrance to Catania’s harbor. The tour continued on to its turnaround point in Aci Trezza. 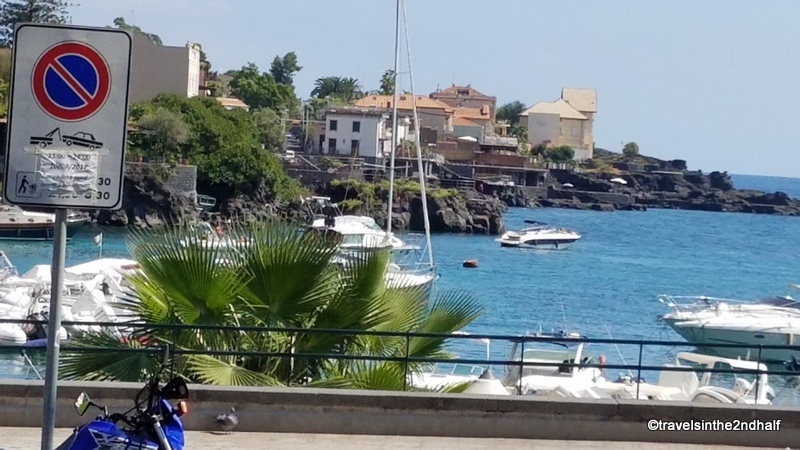 This lovely seaside town is best known for the Isoli dei Ciclopi. According to legend these are the rocks that the Cyclops threw at the fleeing Odysseus as told in Homer’s Odyssey. The tour stopped here for about 15 minutes, enough time take a couple of photos and grab some water before the trip back to Catania. 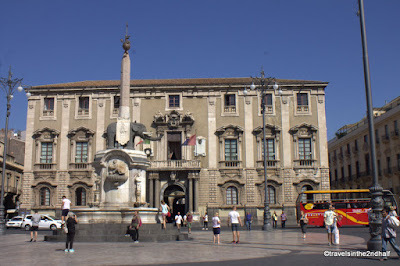 The Piazza Duomo is in the historic center of Catania, at the southern end of Via Etnea, the main shopping street. Here you can find two different companies offering the Hop-on/Hop-off tour. We used Tourist Services (the red bus) which offered a two day ticket that included a tour of Mt.Etna for €40/person. Thank you for the mini tour of Catania. 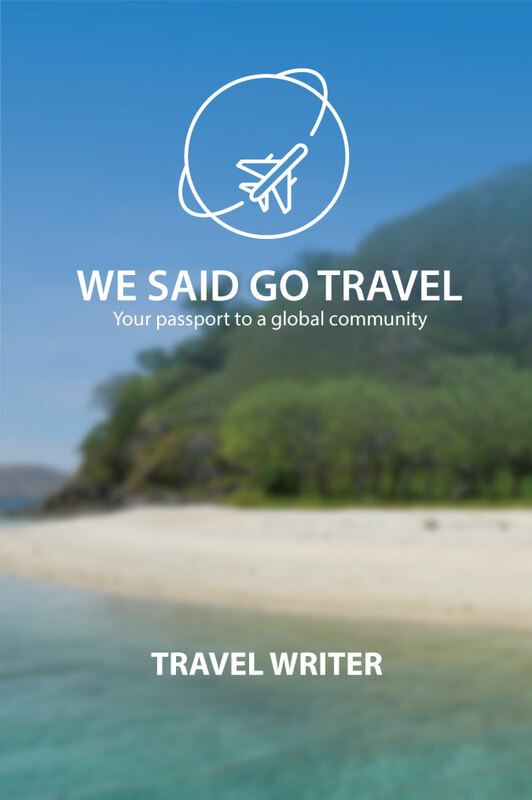 Hope I can visit some time.